Outlet Valve Test - The outlet valve can be isolated for airflow leakage under tightly controlled pressure and flow conditions. 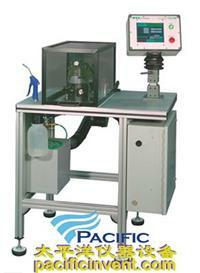 Drink Tube Flow Test - The drink tube flow and resistance are measured to determine if there is blockage in the tube. 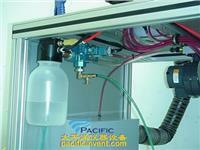 Drink Tube Valve Test - The drink tube valve is tested for leakage under controlled pressure conditions. Drink Train Leak Test - The entire drink tube is tested for leakage under controlled pressure conditions. Parallel Measurement - Dual detection systems can provide parallel measurement of leakage in two areas of the mask simultaneously, such as nose cup and eye lens area. Hose Testing - Enables full leakage testing of masks with air supply hoses. Fit Testing - Aerosol-based quantitative fit testing of protective masks on human subjects can be provided with full user-controlled flexibility for setting the number of tests, test length, alarm points, etc. Extra Test Heads - The base TDA-99B includes one medium or small test head with an inflatable peripheral seal. Additional test heads can be provided for testing an extremely wide variety of full-face and neck-seal protective masks. Breathing Simulation - Although typical leakage tests use a constant airflow under negative pressure, the TDA-99B can be integrated with a full-function sinusoidal breathing system to simulate a wide range of human respiratory patterns. Mil-Spec Mask Flexing - If required, the TDA-99B can be easily modified to incorporate Mil-Spec flexing hardware and fittings, with full data logging capability. 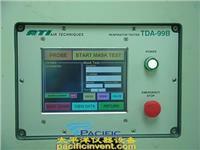 Since all TDA-99B Protective Mask Test Systems are made to order, additional testing functionality and options can be designed to meet your specific needs.